The Valley of a Thousand Hills hummed with a new kind of activity as warriors with shining spears faced the barrage of the drum-like equipment prepared to "shoot" them as they came shrieking across the plain. The locale was South Africa; the tribes, the fierce Zulus, enthusiastically resisting the advance of civilization as it was to be recorded by Twentieth Century-Fox's CinemaScope cameras. 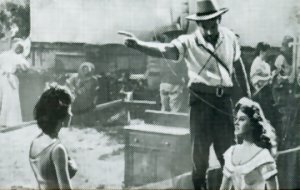 The result of this "skirmish" and other such individual scenes according to the pioneering studio, make "Untamed" a pictoral giant without peer since the advance of the new motion picture medium. The newest, most powerful of anamorphic lenses has captured an Africa that has never been seen on the screen before as it sweeps across the mighty veld, plunges you into steaming jungles and into the stampedes of wild animals and still wilder humans. This is a picture of pure adventure that starts in the seething streets of Capetown and penetrates into the heartland of Africa. To make this thrilling film, Twentieth Century Fox sent an expert crew under Director Henry King on a three-month trek. The first thing this crew did was to create a thriving tent community called "Zanuckville" (named for the company's production chief), inhabited by some 2500 hot-tempered Zulus corralled for the picture from distances up to 300 miles. "We had nothing like the dangers of the original trek around the middle of the last century," King reported, "but we must have had at least as many complexities." While the Boers had to fight them, the movie company had to care for the Zulus within the very strict framework of rules set up for their welfare by the South African government. This also meant that the Americans had to board them, provide medical care, entertainment, and even a government. The government worked through Zulu chieftains, but it was necessary for King and his men to keep maximum control since they were to be armed with spears, normally forbidden; dress them in their ancient habiliments of war; set them to singing traditional war chants and then unleash them to attack a train of "voortrekkers." It was a situation to be handled with care. For entertainment, and to keep the tribes intact for the necessary shooting period, the studio put up the outdoor theatre. The shows were not a great success, however. Most had never seen a movie before and to prevent their being frightened, King's men demonstrated that the figures on the screen were only shadows. Once the Zulus understood this, they lost all interest. Finally the Native Affairs secretary gave the right prescription. "We were required to build a brewery to make kaffir beer," King related. "This beverage is high in nutriment and low in alcohol and we were happy to comply, especially after we discovered that Zulus are not particularly fascinated with movie making and that it would be difficult to dissuade them from going home." 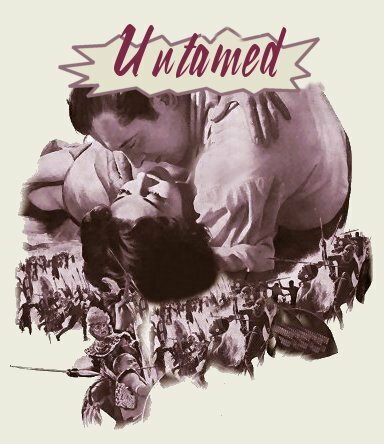 "Untamed" was produced by Bert E. Friedlob and William A. Bacher from a screenplay by Talbot Jennings, Frank Fenton and Michael Blankfort.